Komárno is a town at the confluence of the rivers Danube and Waag at a sea-level of 108-115 m. It is an ancient settlement of the Carpaths basin and a town of a very rich historical past. The territory has been inhabited since the early Bronze-period. First the Celtes had settled here and nearby on the left shore of the river Danube the Romans have established a Legion-Camp known under the name of Brigetio and so was the town itself established by them. In the migration period the Avars have stayed here for longer time. After the Magyars Conquest at the mouth of the rivers Danube and Waag a fortified castle had been built. 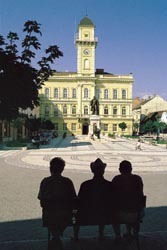 Komárno became a county residence following the governments organization. Beside this fortified castle a settlement of indentical nomination had been established too. The gone by towns had acquired some privilige from the King Adalbert IV. in 1265. On the place of the middle aged fortress another fortress had been erected against the Turkeys. That fortress bore the name Old Fortress. And this was enlarged under the region of Leopold I. named New Fortress. In the 18. century it had been the centre of the guild industry too. In 1745 Maria Teresia raised Komárno for a Royal Priviliged town. In the years 1763, 1783 Komárno was the place of terrible earth?quakes. As an effect of the Napoleon Wars the Vienna Court decided the rebuilding of the fortress to make it possible forstationing 200 thousend soldiers and that time it was a reliable strong fortress system. The rebuilding of the fortress ceased in continuing because of the Hungarian Independent wars. In 1848 the Great Fire ruined the town completely. Next year the ravage continued by the empires canons nad army. The defender of the town was Georg Klapka who resisted the ennemy, but after so many battles the town was in ruines. In the seventhy years of the 19. century the building of the fortress was completed but the town because of the chain of fortifications caused its decline. Only in the 19. century began the developping agan. That was mainly therefore, because Újszőny was joined to Komárno being situated on the side of the Danube. Now there was space for expanding. In 1919 right the left side of the river together with Komárno was joined to the Czechoslowak Republik an became a border town of the Republik. In November 1938 according to the Vienna first decision Komárno was joined to Hungary. Presently it is a district residence with 38 000 inhabitants with remarkable machine industry, it posseses a ship yard a bright tourists traffic and with a vivid cultural life. Two third of the inhabitants are of Hungarian nationality and like that it has become one of the cultural centre of Hungarians living in Slovakia.